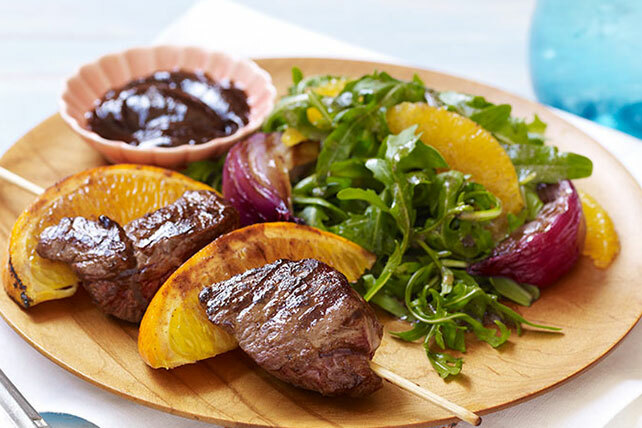 Ground allspice and fresh-squeezed orange juice give these lamb kabobs their outstanding flavor. Cut 2 oranges into 6 wedges each. Thread lamb and oranges alternately onto 4 skewers. Thread onions onto separate skewer. Squeeze juice from 1 of the remaining oranges into small bowl. Add barbecue sauce and allspice; mix well. Reserve half the barbecue sauce mixture. Grill skewers 15 min. or until lamb is done, turning and brushing with remaining barbecue sauce mixture for the last 5 min. Remove onions from skewer; place in large bowl. Peel and section remaining oranges. Add to onions with arugula and dressing; mix lightly. Place on platter; top with kabobs. Serve with reserved barbecue sauce mixture. If using wooden skewers, soak them in water for 30 min. before using to prevent them from burning on the grill. Refrigerate any leftovers; spoon onto 6-inch flour tortillas. Roll up; place on microwaveable plate. Microwave on HIGH 3 min. or until heated through. Or, spoon leftovers into pita pockets and microwave until heated through. Substitute boneless beef top sirloin steak for the lamb.